"Artists who create gargoyle statues can express humanity and emotion in a creative fashion by using distorted or fantastic forms". Gargoyle statues appeal to both our imagination and our subconscious. Gargoyles can take our human characteristics and exaggerate and change them to symbolise the many aspects of our personalities. 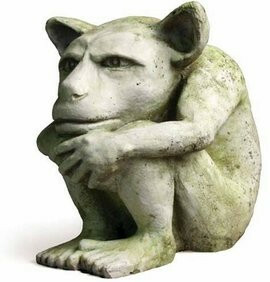 Gargoyle statues can be blended with animal forms but they are differentiated from animals by the human features of imagination, creativity, humour and an appreciation of art. The very things that make us human. Not all medieval gargoyles were intended to frighten, reprimand or threaten. In fact some gargoyles appear to have been created to amuse or entertain us. A form of popular entertainment long before the monsters of Steven Speilberg captivated todays public. A significant number of gargoyles, even though they leer and sneer, have something very appealing about them. 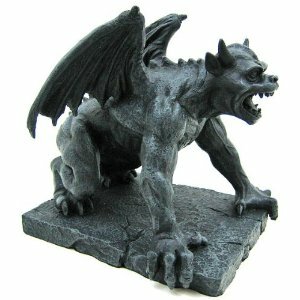 I have found the best selection of gargoyle garden statues at Amazon.com . They have gargoyles designed by a variety of artists and often have sale items at bargain prices! My favourite gargoyles are by Design Toscano but I also love and own this Dedo Garden Gargoyle Statue by Orlandi Statuary. ﻿﻿﻿﻿﻿In medieval times no two gargoyles were ever the same. They came in a multitude of fantastic forms; from mystical beasts to grotesque monsters incorporating the features of animals, humans and mythical beasts in funny, frightening or bizarre ways. 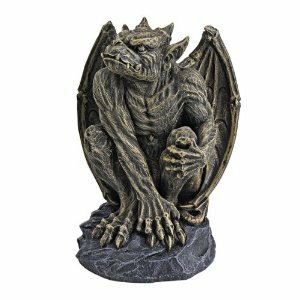 Today neo-Gothic artists have created gargoyle statues for our homes and gardens in a huge range of designs and sizes, from imposing life-size gargoyles to smaller, more whimsical pieces. To offer you some inspiration, these are a collection of just some of my personal favourites. 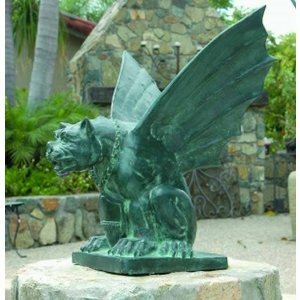 What is important is that you choose a gargoyle that appeals to you, one that brings you joy or creates a dramatic statement in your home or garden. Emmett the Gargoyle sculpture. 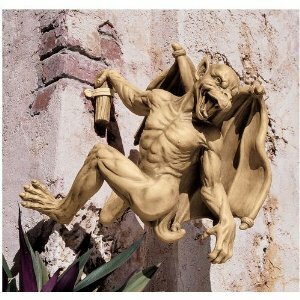 A classic gargoyle by Design Toscano. One of the original medieval creatures that pensively perched from European rooftops and turrets. This muscular fellow is cast in quality designer resin with a weathered dark grey stone finish. Love the expression on his face! Socrates The Thinker. 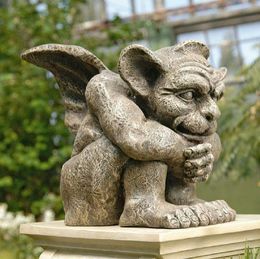 At nearly two feet tall, this muscular gargoyle is a menacing presence flanking a garden path, joining you on the patio or sitting stately inside next to the fireplace. 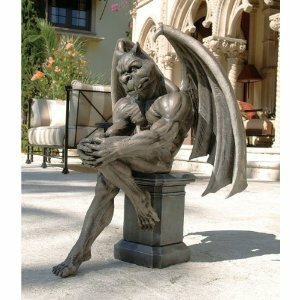 Featuring intricate detail, a horned head with spiked fangs and powerful wings, he sits upon a pedestal deep in thought. Gaston the Climbing Gargoyle. Created in the gothic tradition of gargoyles who climbed the famous medieval cathedrals of Europe to taunt passers by, this imposing gargoyle created by artist Liam Manchester, will look fantastic hanging from a tree or climbing your home or garden wall. Large size. 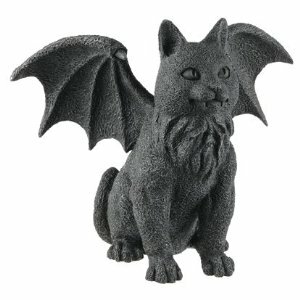 The Winged Cat Gargoyle is popular with collectors of gargoyles and cat lovers. Made of cold cast resin it looks great on bookshelves, entrance stands or on the coffee table. Can be used outdoors also. Gargoyle Downspout. 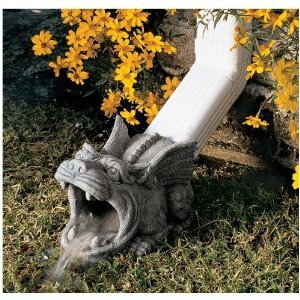 With wide-open mouths to steer water from your downspouts onto your lawn this gargoyle stops water from damaging your foundations. Gothic sculptural detail with scaly skin and wide eyes. (Fits standard rectangular downspouts up to 2¼"x3"). Chained Cathedral Gargoyle. This one one of Design Toscano's original garden gargoyle designs. Reminiscent of the Gothic ornaments that perch pensively atop European rooftops and turrets to ward away evil, it makes the perfect sentinel watchdog for your front gate, garden grounds or fire hearth. Picc-a-Dilly Gargoyle Sculptures. These troll like gargoyles can't stop picking. 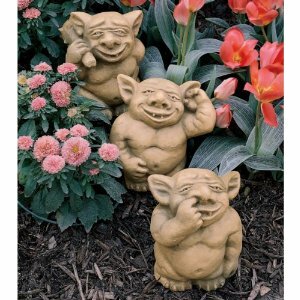 With troll like features you can collect the set of three and laugh it off to bad habits. Talisman-Gargoyle of the Eclipse. Followers of noted artist Manchester will recognize the skilful sculpt in his latest creation, Talisman. Inspired by the moment when light turns to dark, he's crafted this "Master of the eclipse" with spiked horns and a truly evil countenance. Cast in quality designer resin exclusively for Toscano, Talisman is finished in Gothic green tones. 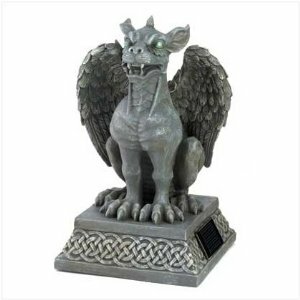 Gargoyle "Conall" - Collectible Figurine Statue is a classic frightening gargoyle crafted in quality resin with the look of stone. 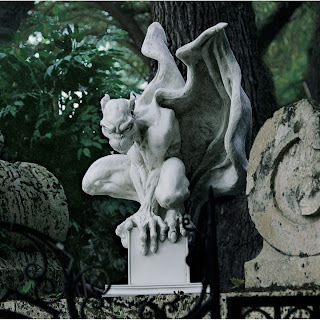 It is believed winged gargoyles will come to life at night and fly around your house, protecting it from evil. A perfect gift for the gargoyle collector. Hand Cast Stone Green Man Plaque - Gothic Gargoyle. 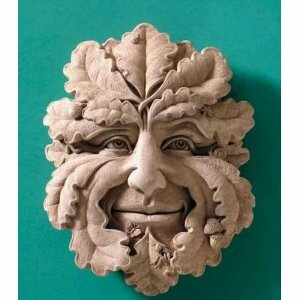 The mythical "Green Man" or Jack-Of-The-Green gargoyle was commonly depicted in medieval times with branches sprouting from it's head or mouth. It is a sign of nature and fertility, promoting the growth of healthy plants. 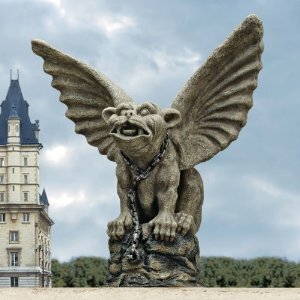 Whether you're a history lover, a connoisseur of gargoyle decor or are looking for an awesome gargoyle gift, you can own a replica of the famous Spitting Gargoyle that sits atop the Notre Dame Cathedral in Paris. The Spitting Gargoyle of Notre Dame does not actually spit water so technically it is a Grotesque but the term Gargoyle has come to include both. Just as this statue faithfully protected the Cathedral of Notre dame and the entire city of Paris for hundreds of years, now you can have your own Notre Dame Spitting Garoyle to keep your family and loved ones safe. Own a piece of history with this ancient Spitting Gargoyle, cast in quality designer resin with a faux stone finish and worthy of display as a coveted and historic work of art. Silas the Gargoyle Sentry Statue is a two-foot-tall Gothic sentinel is ready to pounce on unsuspecting predators to your home or garden! Following the legendary European heritage of gargoyle sentries, artist Manchester has chiseled Silas with muscular haunches and spiny talons, bat-like wings, a threatening jaw and flared nostrils. This Solar Garden Gargoyle Statue has eyes that light up in the dark! The eyes glow with an eerie light that will frighten off any evil that threatens your home! Made from poly resin with a faux stone finish. 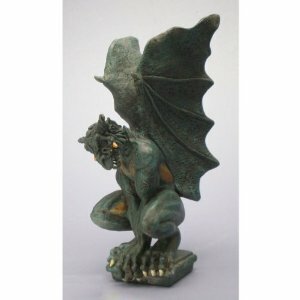 This gargoyle statue is very popular! This Solid Bronze Medieval Gargoyle by Digital Angel makes a fierce sentry with broad, muscular shoulders and an appealing wrinkled face. Looks great as a pair. Suitable for all weather conditions. This Emmett Fiber Stone Gargoyle statue is another one I have in my collection (yes, I like the whimsical looking gargoyles!). Made from a stone and fibreglass casting he can withstand all weather conditions. Looks great nestled under a tree or on a pedestal in the flower bed. Hello i just want to say you that this blog post is quite impressive and i appreciate your ideas.Thanks..
All the garden ornament designs are looking quite impressive and superb. I love these statues! I think they are so unique and look really good. Are there statues that have solar energy panels built into them? I think that would be a great idea. From time to time there are some gargoyle statue designs that have a solar light available on Amazon. These are pretty neat! Much cooler than lawn gnomes, at any rate. When our family was traveling in France, my son had some nightmares about the gargoyles he saw on the Cathedral of Notre Dame. They scared him a lot until I told him that the word 'gargoyle' comes from a similar root as 'gargle.' Now that he's older he thinks they're cool. I even showed him some episodes of the old Gargoyles cartoon from the 90s. Maybe I should buy him one of these statues for his birthday. I can imagine a child having nightmares about the more frightening gargoyles at Notre Dame, but they are cool also. Your son is right! Over the years my mother has collected stone garden statues. It is one of her hobbies to work in her garden and so she feels like stone statues help her garden feel more personalized. Since mother's day is coming up I had the idea to get her a new statue. I think she will be really happy and like it a lot. 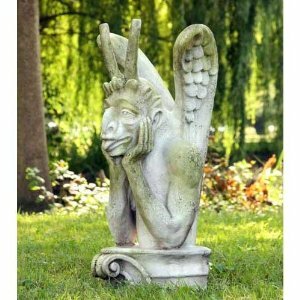 I love garden statues and the fact that you can get these gargoyle ones is even better. No I must have most of these statues because of how unique they are and how cool they look. It will add to the look of my garden and will be perfect year round. I am looking to decorate my front garden more. Right now it looks bleak and miserable. I think statues like these would fix that. I really like the winged cat statue. My wife loves cats, so she would love this. This article really helps people see why having gargoyles in our yards is a good thing. I really like how you pointed out at the start of the article that gargoyles are a way to represent us and our personalities. 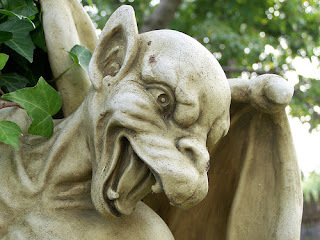 Gargoyles help ur yards by giving style to them in a way that helps others see what kind of people we are. The fourth picture is my favorite. It looks really funny how he is posing with his legs! I would love to have something like this in my garden, I think it would look good next to my muscular gnome. 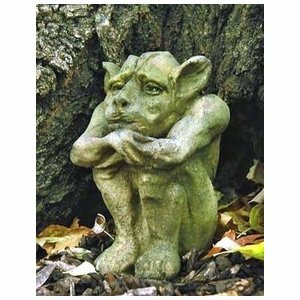 It is one of the best idea to decorate the gardens with this Gargoyle Garden Statues. It looks fabulous on gardens. Thank you for sharing such good post with us. solar garden decorations Decorations Home Decor Stakes Yard Decorative Stake Light Deal of The Day Prime Today Sogrand Warm White LED Stainless Steel, Landscape Lamp for Outside Patio Lawn 3Pack : Garden & Outdoor - Online shopping from a great selection at Sogrand Industry Inc Store. "Nice Solar Pathway Lights !!! Thanks for sharing gorgeous Solar Pathway Lights . I think I'am going to be on the look out for more of these attractive Solar Pathway Lights myself. Online shopping for crackle glass solar lights outdoor decorative, outdoor solar lights garden, solar garden lights outdoor stakes, solar garden decorations, solar landscape lights outdoor, solar yard lights outdoor, solar garden stake lights and solar stake lights outdoor with more great selection at Sogrand Industry Inc Store. Find the best solar lights outdoor decorative, outdoor solar lights garden, solar garden lights outdoor stakes, solar garden decorations, solar landscape lights outdoor, solar yard lights outdoor, decorative solar light outdoor, solar stake lights outdoor & solar garden stake lights Online shopping from a great selection at Sogrand Industry Inc Store. Solar garden decorations - Get the best deal on solar lights outdoor pathway, solar garden lights, solar garden decorations, solar path lights, solar walkway lights, solar yard lights, solar landscape lights & solar stake lights on amazon.com from great selection at Sogrand Industry Inc Store. Solar garden decorations - Get the best deal on solar lights outdoor, solar light, solar garden lights, solar garden decorations, solar pathway lights, solar path lights, solar walkway lights, solar yard lights, solar landscape lights & solar stake lights at amazon.com from great selection at Sogrand Industry Inc Store. Solar stake lights - Get the best deal on solar path lights, solar led lights, solar garden stake lights, solar landscape lights, solar stake lights, solar lights outdoor, solar yard lights, solar pathway lights, solar walkway lights & solar driveway lights on amazon.com from great selection at Sogrand Industry Inc Store. solar garden decorations - Get the best deal on solar path lights, solar led lights, solar landscape lights, solar stake lights, solar lights outdoor, solar stakes, solar yard lights, solar pathway lights, solar garden decorations & solar garden lights on amazon.com from great selection at Sogrand Industry Inc Store. solar garden decorations - Get the best deal on solar path lights, solar lights outdoor pathway, solar led lights, solar landscape lights, solar stake lights, solar stakes, solar yard lights, solar pathway lights, solar garden decorations & solar garden lights on amazon.com from great selection at Sogrand Industry Inc Store. Best Solar Garden Lights Reviews for garden decor are very impressive. Best Outdoor Solar Lights under $30 available in many colors, from white to red and in all the middle colors. You can even get someone to change the color. No matter what color and design you choose for the outdoor decoration, you will definitely find it.